Shah Rukh Khan's birthday bash was attended by many B-town biggies who were seen having quite a lot of fun time posing for some crazy selfies. King of Bollywood Shah Rukh Khan turned 49 on Sunday, 2 November. As his fans gathered outside Khan's lavish home Mannat to have a glimpse of the actor on his special day, the actor celebrated with them by cutting a cake. 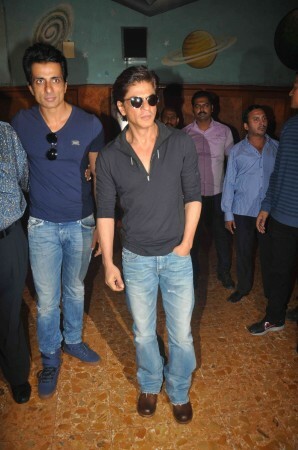 The evening saw B-town celebs arriving at the birthday bash thrown by Shah Rukh's wife Gauri Khan. Gauri hosted the party to mark both Shah Rukh's birthday and the success of their film "Happy New Year". The function was attended by many B-town biggies and were seen having quite a lot of fun time posing for some crazy selfies. Abhishek Bachchan, Aishwarya Rai - who celebrated her birthday on 1 November, a day prior to Shah Rukh's, Karan Johar, Karisma Kapoor, Hrithik Roshan, Deepika Padukone, Sonu Sood, Vivaan Shah, Farah Khan, Varun Dhawan, Malaika Arora Khan, Ranveer Singh, Ali Zafar were among others who attended SRK's bash. Check out some inside pictures of celebs enjoying some fun time at the bash.